Ivan VI Antonovich of Russia (Ivan Antonovich; ), ( – ), was proclaimed Emperor of Russia in 1740, when he was newborn child, although he did never actually reign. Within less than a year, he was overthrown by Empress Elisabeth of Russia, Peter the Great's daughter. Ivan spent the rest of his life as prisoner and was killed by his guards in an escape attempt. Ivan was born in Saint Petersburg to Prince Antony Ulrich of Brunswick-Lüneburg and duchess Anna Leopoldovna of Mecklenburg, niece of Empress Anna of Russia and grand-daughter of Tsar Ivan V. His grand-aunt Empress Anna of Russia adopted the eight-week-old boy and declared him her successor on 5 October 1740. On the death of Anna (17 October of the Julian Calendar/28 October of the Gregorian Calendar, 1740) Ivan was proclaimed Emperor, and on the following day Ernst Johann von Biron, duke of Courland, became Regent. On the fall of Biron (8 November), the regency passed to the baby Tsar’s mother, though the capable vice-chancellor, Andrei Osterman conducted the government. Thirteen months later a coup d'état placed the Empress Elizabeth on the throne (6 December, 1741), and Ivan and his family were imprisoned in the fortress of Dünamünde (13 December 1742) after a preliminary detention at Riga , from whence the new Empress had at first decided to send them home to Brunswick. In June 1744, following the Lopukhina Affair, they transferred him to Kholmogory on the White Sea , where Ivan, isolated from his family, and seeing nobody but his gaoler (jailer), remained for the next twelve years. Rumours of his confinement at Kholmogory having leaked out, he was secretly transferred to the fortress of Shlisselburg (1756), where he was still more rigorously guarded, the very commandant of the fortress not knowing the identity of "a certain arrestant". On the accession of Peter III (1762) the condition of the unfortunate prisoner seemed about to improve, for the new emperor visited and sympathised with him; but Peter himself lost power a few weeks later. In the instructions sent to Ivan’s guardian, the latter received orders to chain up his charge, and even to scourge him should he become refractory. On the accession of Catherine II (summer 1762) still more stringent orders were sent to the officer in charge of "the nameless one". If any attempt were made from outside to release him, the prisoner was to be put to death; in no circumstances was he to be delivered alive into anyone's hands, even if his deliverers produced the Empress’s own sign manual authorising his release. By this time, twenty years of solitary confinement had disturbed Ivan's mental equilibrium, though he does not seem to have been actually insane. Nevertheless, despite the mystery surrounding him, he was well aware of his imperial origin, and always called himself Gosudar (Sovereign). Though instructions had been given to keep him ignorant, he had been taught his letters and could read his Bible. Nor could his residence at Shlisselburg remain concealed forever, and its discovery was the cause of his ruin. A sub-lieutenant of the garrison, Vasily Mirovich, found out about him, and formed a plan for freeing and proclaiming him Emperor. At midnight on 5 July 1764, Mirovich won over some of the garrison, arrested the commandant, Berednikov, and demanded the delivery of Ivan. His jailers, on orders of their commander, an officer surnamed Chekin, murdered him then and there in obedience to the secret instructions already in their possession. Mirovich and his supporters were arrested and executed soon thereafter. 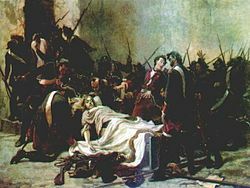 Ivan was buried quietly in the fortress, and his death secured Catherine II's position on the throne until her son came of age. V. A. Bilbasov, Geschichte Catherine II (vol. ii., Berlin , 1891—1893).